Lewis Hamilton has won the Belgian Grand Prix for a 2nd time after leading almost every lap from pole position. Hamilton wasn’t challenged for 42 of the 43 racing laps after fending off a brief threat from Sergio Perez on lap 1. Nico Rosberg finished 2nd ahead of Romain Grosjean, who put in a brilliant drive from 9th to take his and Lotuses first podium since 2013. Sebastian Vettel was on course for the podium until a penultimate lap tyre blowout after not pitting for 27 laps. 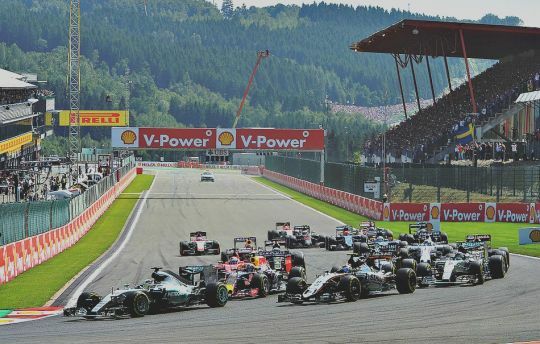 The clear skies and sunny conditions remained as the start of the 2015 Belgian Grand Prix neared. Rain looked unlikely to hit during the race, but increased wind speeds made the chances of a late race shower a little more likely. This was at the back of the drivers’ minds as they lined up on the grid, with Lewis Hamilton and Nico Rosberg once again heading the field and hoping for no repeat of their poor starts in Hungary. What made the start even more uncertain were the new regulations for the start. Now, there are restrictions on adjustments to the clutch bite points and more. These new procedures had the potential to really mix up the race start. Yet another curve ball was thrown at the start when the drivers were forced to make an extra formation lap for the sick Force India of Nico Hulkenberg. He reported that his car had no power on his formation lap but was told to take the start. He then waved to the officials in distress as his car didn’t look to have improved. He was pulled into the pit-lane as all the drivers but Carlos Sainz, who also had power issues, took to the grid. The race finally got away, with Lewis Hamilton maintaining the lead on the run down to La Source. His team-mate had a woeful start however as he was pushed down to 5th by Sergio Perez, Daniel Ricciardo and Valtteri Bottas. Perez then set about trying to demote Hamilton on the run to Les Combes, but Hamilton was able to hold the lead. Rosberg immediately began his fight back to the front at the end of the lap as he got by Valtteri Bottas at the bus stop chicane. Hamilton soon began to stretch his legs at the front of the pack as he pulled out a 7 second lead by the end of lap 8. Some drivers started to make their first pit-stops, with Daniel Ricciardo pitting a lap before Sergio Perez. The pair had been running 3rd and 2nd respectively, but Ricciardo managed to undercut Perez to get ahead of him thanks to the early stop. It seemed as though the soft tyres were not lasting very long at all, with drivers such as Grosjean, Verstappen Massa and more all pitting at the start of lap 10. Grosjean had moved his way by Bottas before the stop but emerged just behind him. He used the DRS and the slipstream to set up a move around the outside of Les Combes to retake the position. It turned out that Williams had accidentally put one medium tyre on Bottas’ car when all 4 were meant to be softs; a very strange mistake by the team that would lead to a drive through penalty. Hamilton, Rosberg and Vettel had yet to stop on lap 12, with Rosberg finally doing so at the end of the lap. Mercedes told Nico that he would be racing Ricciardo if he had a good in-lap, but it was in-fact Perez that he was racing. Rosberg emerged ahead but the momentum of Perez allowed him to draw alongside down the Kemmel straight. The move would not be completed, with Rosberg holding on under-braking for Les Combes. Hamilton pitted at the end of lap 13, with Vettel continuing to stay out in the Ferrari. Lewis emerged well clear of Rosberg and he would re-take the lead of the race when Vettel pitted at the end of the next lap. The German re-joined in 6th place. Romain Grosjean was making great progress through the field in the Lotus. The Frenchman had qualified 4th yesterday before being dropped to 9th with a gearbox penalty. By lap 20 he had worked his way back up to his original qualifying position and he soon made it one better by blasting past Sergio Perez for the final podium position. 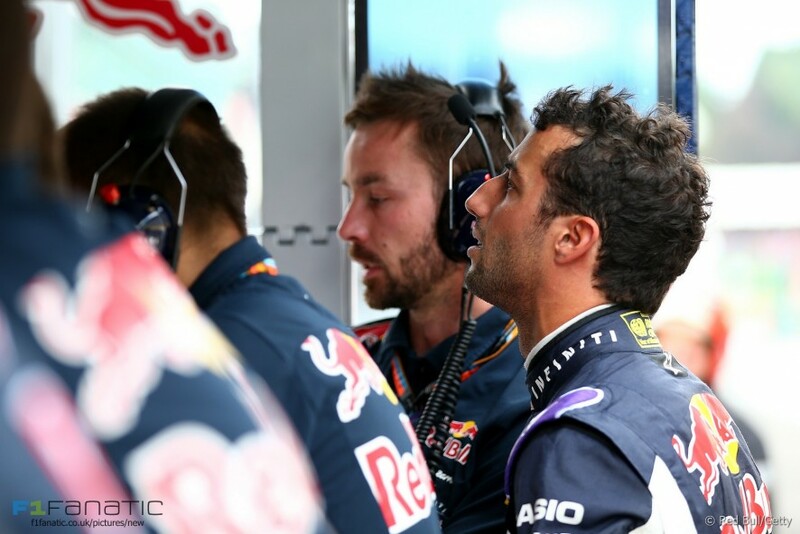 Daniel Ricciardo had been one of the men demoted by Grosjean on his rise through the field, but soon he would be demoted of all his positions after he pulled his car to the inside on the exit of the final chicane. Last year’s Belgian Grand Prix winner was out of the race. This caused a virtual safety car as his Red Bull was recovered. A number of drivers made pit-stops under the virtual safety car, including Perez, Massa, Raikkonen and more. Grosjean was also one of the drivers who pitted for a second time as he fell to 4th behind Vettel who chose not to pit. The virtual safety car ended, with Hamilton now only leading by 2 seconds as opposed to the 3 second lead he had before. Lewis complained on the radio that Rosberg seemed to have unfairly gained during the race neutralization. Thankfully for Lewis, he seemed to have the better pace over his team-mate as he soon stretched his lead up to over 5 seconds by lap 30; the lap that he made his final pit-stop on. Rosberg followed him in on the next lap, with the pair maintaining their positions with just over 10 laps to go. 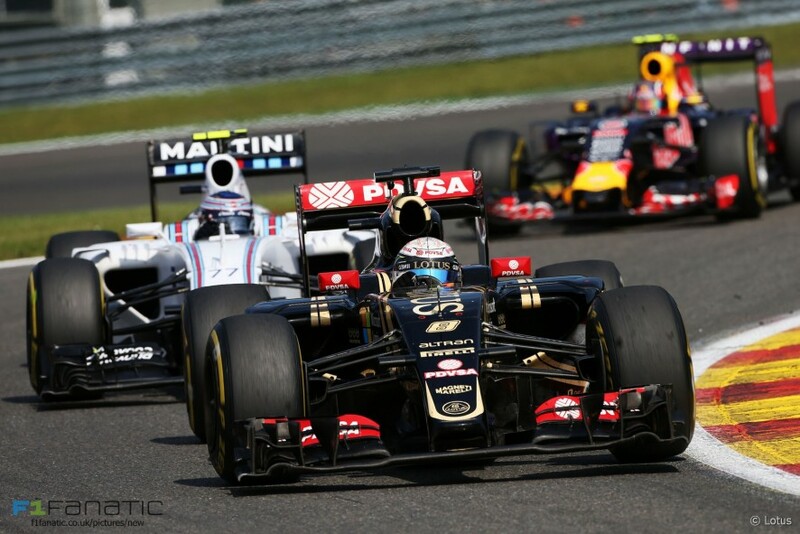 The battle for the podium really heated up in the last few laps, with Grosjean closing in on 3rd placed Vettel. Grosjean had pitted once more than Vettel, meaning that the Frenchman had much better tyres on his Lotus. With 3 laps to go, Grosjean was within a second and now had DRS to use to his advantage. It looked as though Vettel might have just done enough with 2 laps remaining as Romain appeared to lose a little ground, but suddenly the battle threw itself the other way. Vettel was on the Kemmel straight when his right rear tyre exploded. This gave Grosjean the podium he had been fighting for with just a lap and a half to go. Vettel would fall all the way out of the top 10 and would score no points from this weekend. Back up at the front, Lewis Hamilton maintained the gap to his team-mate for the entire final stint to take his 2nd win at Spa Francorchamps. 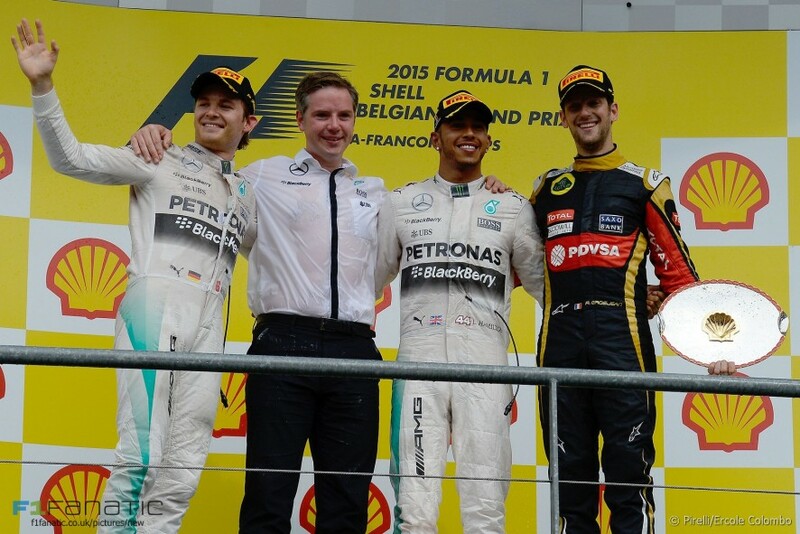 He was victorious in the 2015 Belgian Grand Prix. Nico Rosberg would make it a 1-2 position, a great result for the team following their calamities last year. Romain Grosjean would take the final position on the podium after a stunning drive from 9th on the grid. It would be his and the teams’ first podium since the 2013 United States Grand Prix. 4th place would go the way of Daniil Kvyat, who fought with Sergio Perez and Felipe Massa in the final few laps; with Perez finishing 5th and Massa 6th. They all capitalized on Vettel’s puncture with a lap and a half to go. Kimi Raikkonen took 7th after fending off a final lap assault by Max Verstappen who finished 8th. The Dane tried to out-drag Raikkonen into Les Combes but slid wide under braking. 9th and 10th would go the way of Valtteri Bottas and Marcus Ericsson; with Valtteri rallying back from his team’s pit-stop blunder to take 2 points. Sebastian Vettel finished outside of the points in 12th after his penultimate lap puncture. 4 drivers failed to finish the race. Carlos Sainz got back into the race after his formation lap problems but subsequently retired his Toro Rosso on lap 32 of 43. Daniel Ricciardo, as mentioned earlier, suffered mechanical issues at the bus stop chicane, with Pastor Maldonado and Nico Hulkenberg also not finishing. Lewis Hamilton now leaves Spa with a 28 point lead over Nico Rosberg in the drivers’ championship.Thanks to Ferrari’s unspectacular results, Mercedes have continued to stretch their stranglehold over the constructors’ championship. Mercedes lead with 426 points to Ferrari’s 242.The next round of the championship, the Italian Grand Prix at Monza, takes place in two weeks time.